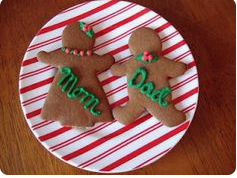 each year that I bake gingerbread men and women to use as place cards on the table Christmas Eve and/or Christmas Day. These can be baked ahead and frozen without decoration and are quite tasty. I use Betty Crocker tubes of red and green frosting to pipe names and minimal decorations on each gingerbread person: collars and ties for the men and holly for the women.